U.S. authorities have identified at least six suspicious packages that were mailed to leading Democratic figures and CNN since Monday. Some of them appear to be similar. A member of the FBI Weapons of Mass Destruction team works outside the Time Warner Center, in New York, Wednesday, Oct. 24, 2018. A police bomb squad was sent to CNN’s offices in New York City and the newsroom was evacuated because of a suspicious package. 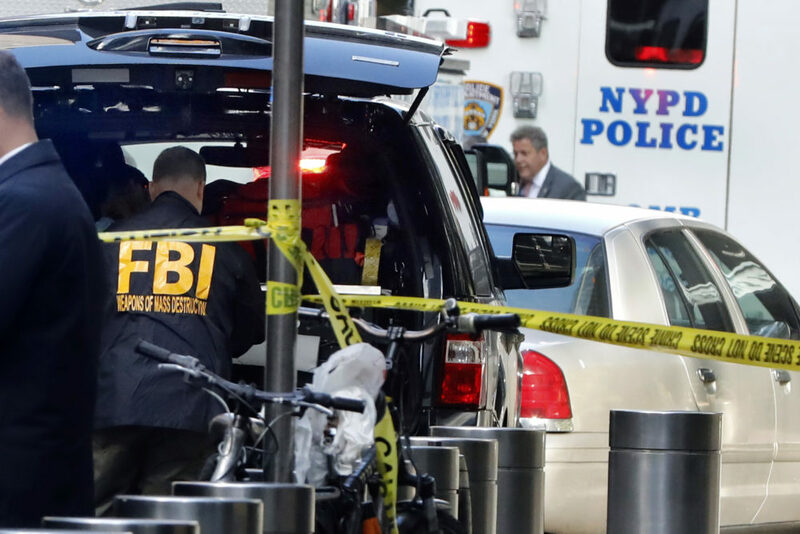 At least six suspicious packages containing what the FBI called potentially destructive devices have been sent since Monday to several leading Democratic Party figures and to CNN in New York, triggering a massive investigation. Some of the devices “appear to be pipe bombs,” John Miller, New York Police Department deputy commissioner of intelligence and counterterrorism, said at a news conference Wednesday. Packages were addressed to George Soros, former Secretary of State Hillary Clinton, former President Barack Obama, former CIA Director John Brennan (care of CNN) and former Attorney General Eric Holder. All bore the return address of the office of U.S. Rep. Debbie Wasserman Schultz, the former Democratic National Committee chairwoman. In a statement issued on Wednesday afternoon Wasserman Schultz expressed dismay over her involuntary association with the menacing threats. “This appalling attack on our democracy must be vigorously prosecuted, and I am deeply disturbed by the way my name was used,” she wrote. “This investigation is of the highest priority for the FBI. We have committed the full strength of the FBI’s resources and, together with our partners on our Joint Terrorism Task Forces, we will continue to work to identify and arrest whoever is responsible for sending these packages,” FBI Director Christopher Wray said in the statement. The Secret Service said Wednesday morning it had intercepted two suspicious packages that were addressed to former Secretary of State Hillary Clinton in Westchester County, N.Y., and former President Barack Obama’s residence in Washington, D.C. The packages addressed to Clinton and Obama contained explosive devices similar to one found Monday at the Bedford, N.Y., home of billionaire George Soros — a frequent contributor to Democratic and progressive causes. An explosive ordnance disposal team did a controlled detonation and destroyed the package. The package sent to CNN, which was addressed to Brennan, contained what “appeared to be a live explosive device” as well as an “envelope containing white powder,” New York City Police Commissioner James O’Neill said at the news conference. The package for Holder “did not reach its intended destination, but was rerouted to the return address in Florida,” the FBI stated. Police in Sunrise said Wednesday morning that they were “working on an investigation of a suspicious package near Sawgrass Corporate Parkway,” which is near the office used by Wasserman Schultz. The package to Clinton was intercepted late Tuesday, and the package to Obama was intercepted early Wednesday morning. The NYPD’s Miller stated that security officials were visiting offices of elected officials and media and television outlets Wednesday to inform them about what to watch for — and, in fact, he says NYPD officials were in the CNN mailroom when the suspicious package was discovered. CNN broadcast images of a yellow mailing envelope addressed to former CIA Director John Brennan and Time Warner Center, also with a return address for Wasserman Schultz in Sunrise, Fla. The explosive device inside was safely removed by the bomb squad using a “bomb truck,” according to Miller, and authorities were working to transport it to FBI laboratories for further investigation, along with the other devices. When the Obamas left the White House, they rented a house in D.C.’s Kalorama neighborhood that they purchased months later. The couple have said they want to remain in Washington, D.C., until their youngest daughter, Sasha, finishes high school. There also were multiple reports of suspicious packages on Wednesday that turned out to be false alarms. The downtown San Diego office of The San Diego Union-Tribune was briefly evacuated because of concerns about a possible suspicious package. That was later determined to be a false alarm and police gave the all-clear. This is a breaking news story. As often happens in situations like these, some information reported early may turn out to be inaccurate. We’ll move quickly to correct the record, and we’ll only point to the best information we have at the time.